And Another One Down (7/365) – Annoyingly Boring? First off, iPhone photo. Left the house Wednesday without my camera – again! 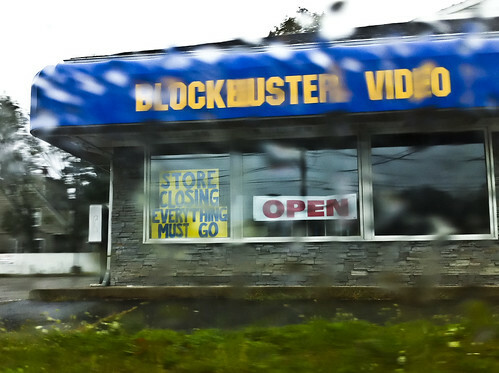 I don’t shed any tears when Blockbusters go belly up. I did my time working in one (not this one)back in the day. Times change. They put plenty of mom and pops out of business, now new technology is doing the same to them. Today was rainy again – and I left the camera at home again. So don’t expect too much for Day 8. Word is that the sun will be coming out for Day 9. I’ll believe it when I see it. have to agree. I never had a good experience in one.